Happy Tuesday, everyone. I hope you all had a beautiful weekend! I fell on Friday (as a lot of you saw on InstaStories), so I stayed really still all weekend and wasn’t able to enjoy it as much as I wish I could have. It was so painful! But, on a happier note, I wanted to share this cold shoulder blouse that is perfect for transitioning into fall. As a former Miami gal, I know how hard it is to style fall looks without feeling like you’re dying of heat. So, for those of you in warmer states, this is your go-to top! I love myself a good fall cold shoulder top and I was excited to get one in this pretty color! Plus, this top is currently 50% off and is only $23. I paired it with my favorite jeans that I’ve worn nonstop ever since I got them at the Nordstrom Anniversary Sale. Make sure to size down, though. I wish I would have but totally forgot to and just decided to keep them. I hope you guys all have a great day! We aren’t supposed to have the best weather in NYC this week but am hoping it isn’t too bad, since I now have to walk around limping… haha! Thanks for stopping by and make sure to add this cute fall cold shoulder top to your wardrobe. 🙂 I’m wearing a medium for reference! That color looks great on you babe! I love this color pink on you! So pretty! 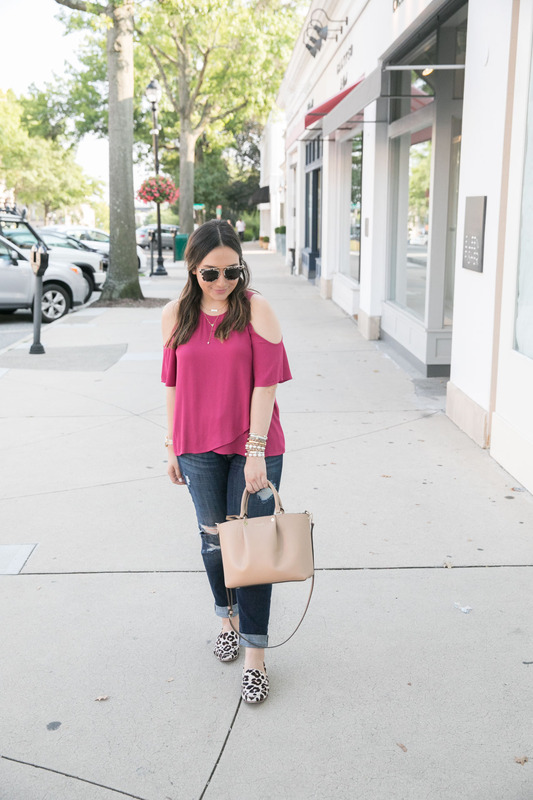 I am loving that shade of pink, so much fun and that cold shoulder top is so pretty! This look is adorable!! I am in love with that top and the color looks amazing on you! What a trendy top! I need one! I seriously love those shoes! and this outfit is so perfect for transitioning to fall! I like the top, but can we talk about those shoes? SO cute! Love that you paired it with some cheetah print! Love this cold shoulder top, and this shade of pink looks amaze on you! Such a cute top! I love the color! This is so pretty!! I love the pop of print with your shoes!